Palestinian rabbi and liturgist; lived at Jerusalem in the seventeenth century. He wrote "Moreh Ẓedeḳ" (Salonica, 1655), an index to the laws contained in the Shulḥan 'Aruk, Ḥoshen Mishpaṭ, showing where they may be found in other works of the Poseḳim as well as in the responsa of later rabbis. There is also ascribed to him another work, "'Et le-Ḥenenah" (Venice, 1708), prayers to be recited at the western wall of the ancient Temple, with additions by the author's son Moses. 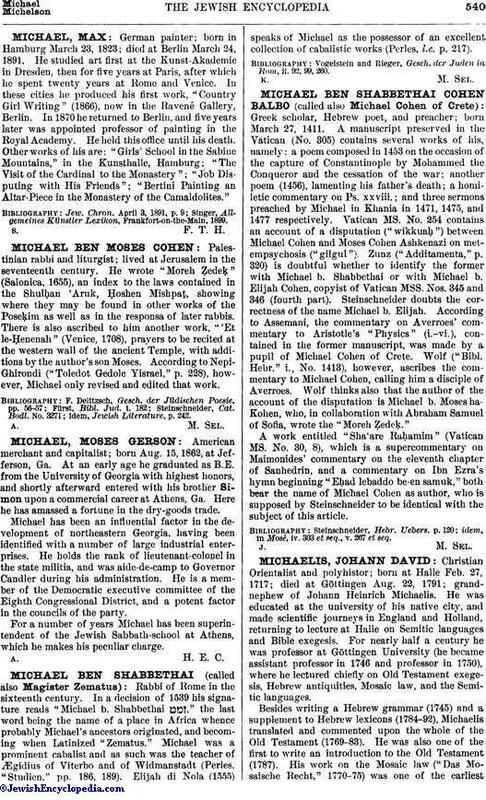 According to Nepi-Ghirondi ("Toledot Gedole Yisrael," p. 228), however, Michael only revised and edited that work. idem, Jewish Literature, p. 242.